The Detroit Medical Center (DMC) is huge. It spans approximately eight blocks from Mack Avenue on the south to East Warren on the north. The east-west boundaries are St. Antoine Street on the east and John R Street on the west. 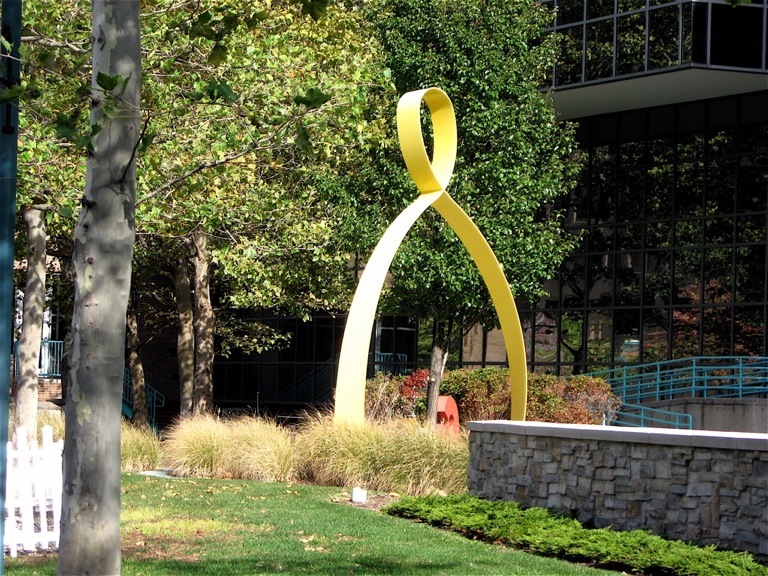 Within the campus boundaries are several major hospitals serving a diverse population, top research institutions and world-class trauma and emergency centers. But there is more to the DMC than medical services. 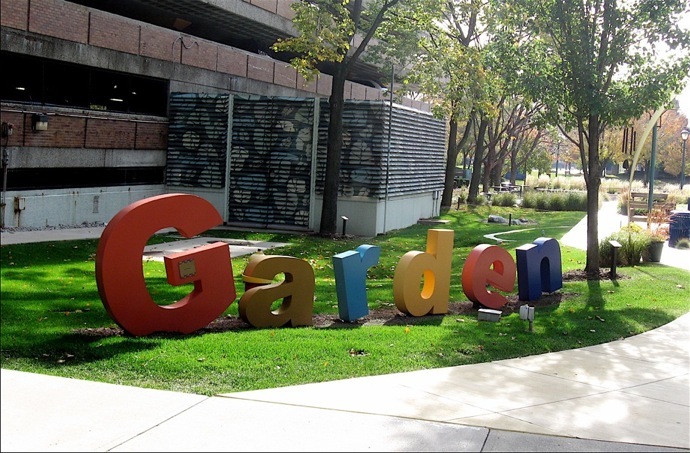 It is home to some of the best architecture in Detroit, designed by the city’s top architectural firms. 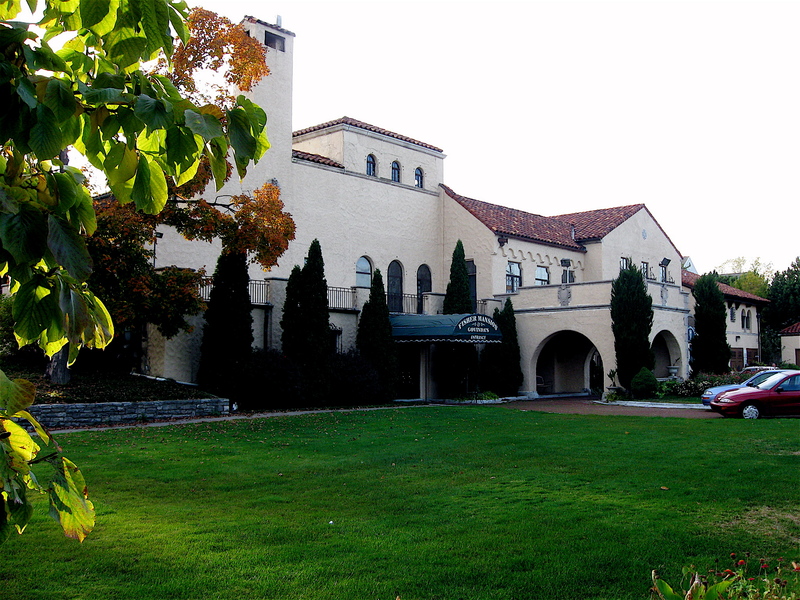 For example, there’s Harper Hospital, designed by Albert Kahn in 1928. 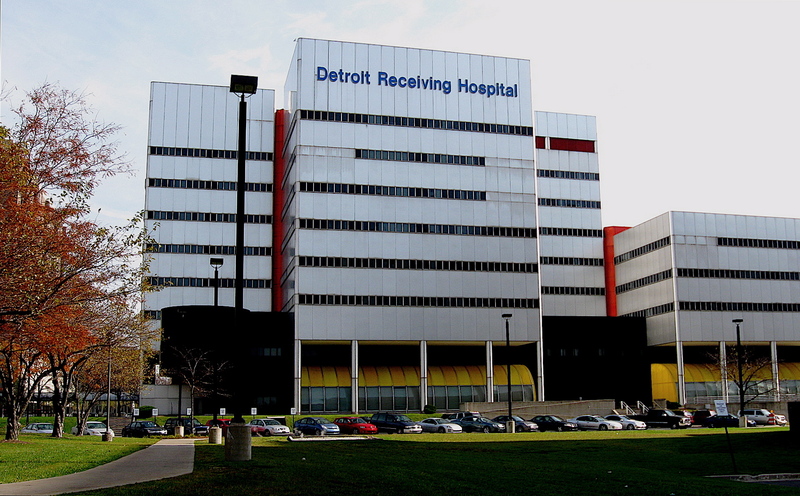 Detroit Receiving Hospital which features an aluminum and porcelain exterior was designed by William Kessler and Associates. It opened in 1979. 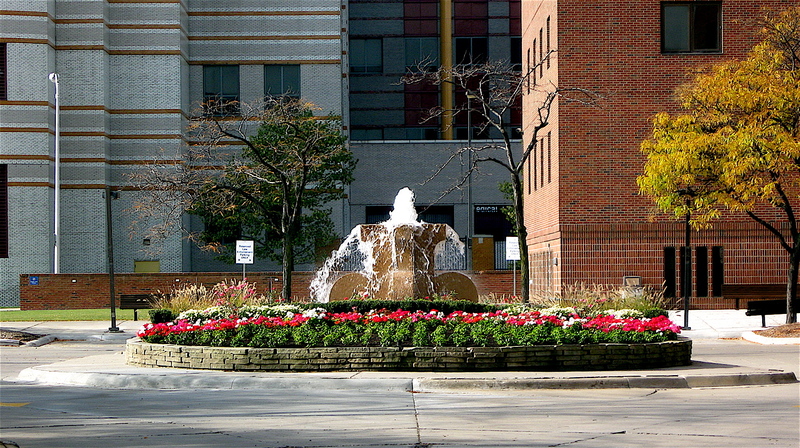 The postmodern John Dingell VA Hospital from Smith, Hinchman, and Grylls opened in 1996 and it boasts an elaborate façade with multi-colored brick. I’ve ridden past this area on occasion and since I was bicycling around the Cultural Center the other day, I decided to explore the DMC campus. It’s something I’ve not done in the past. I started my little two-wheel tour by riding the perimeter of the campus to get a good look at the buildings and the center’s environment. As I was circling the area on its boundary streets, I began to notice walkways and small driveways leading into, what appeared to be, the center of the DMC campus. Curiosity got the best of me, so at the next walkway, I took a sharp left and headed in to see where the walk would take me. Steering my way slowly down the winding brick pavers, I came to a beautiful green space, surrounded by DMC buildings. There I found a relaxing, outdoor picnic and seating area. 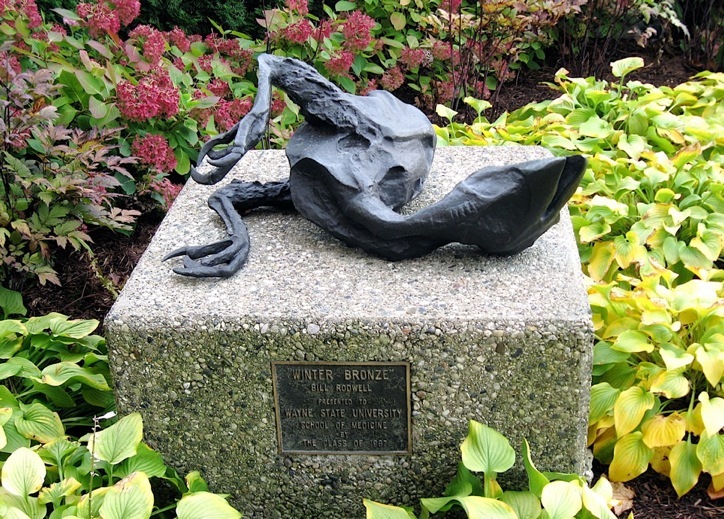 Looking around that park-like setting, I began to see small sculptures and other outdoor art. 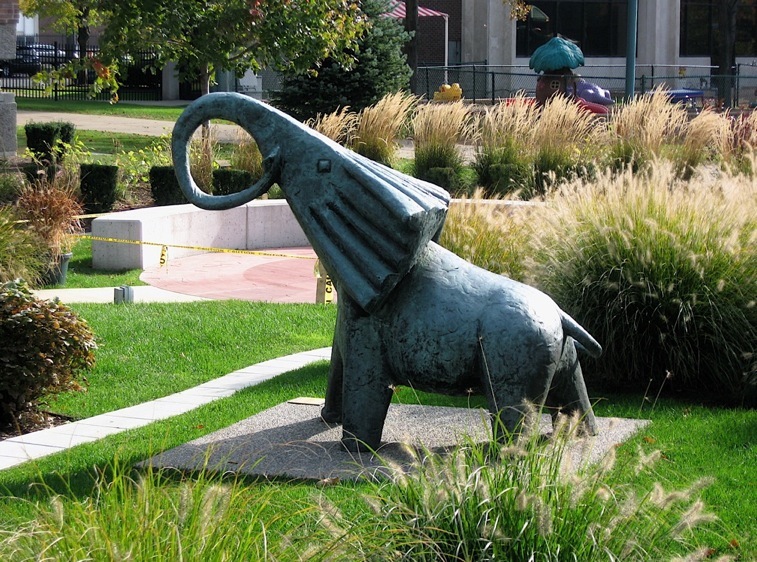 Some pieces were displayed prominently and others blended into the surrounding landscape. 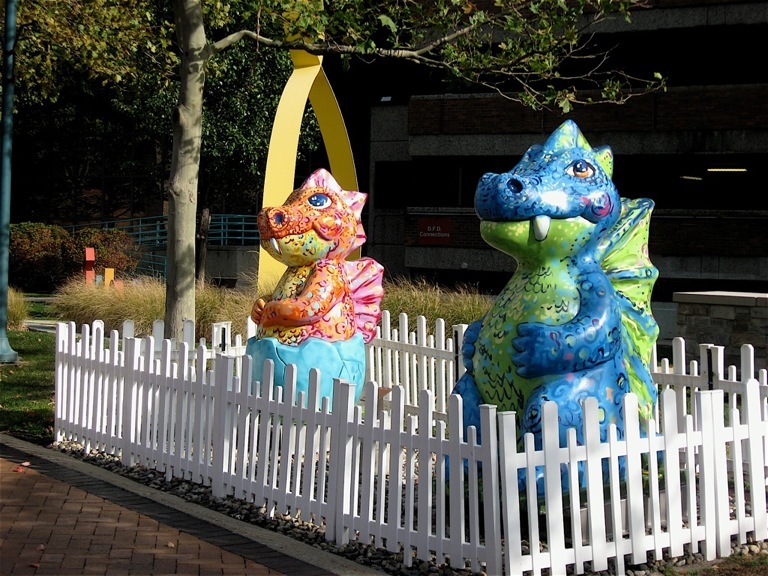 Immediately to my right was an area dedicated to children and children at heart, with many colorful sculptures. 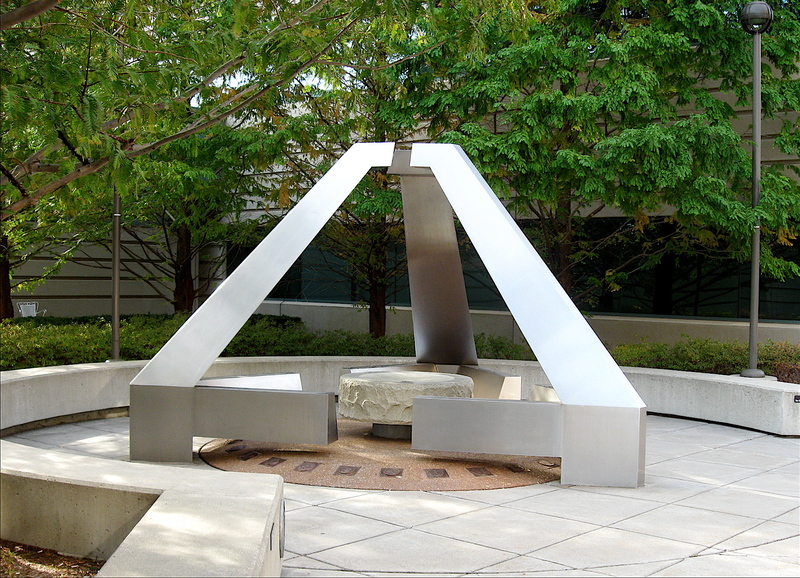 Poking around other areas of the medical center’s campus I came across fountains, metal sculptures, and various statues placed in small pocket parks. 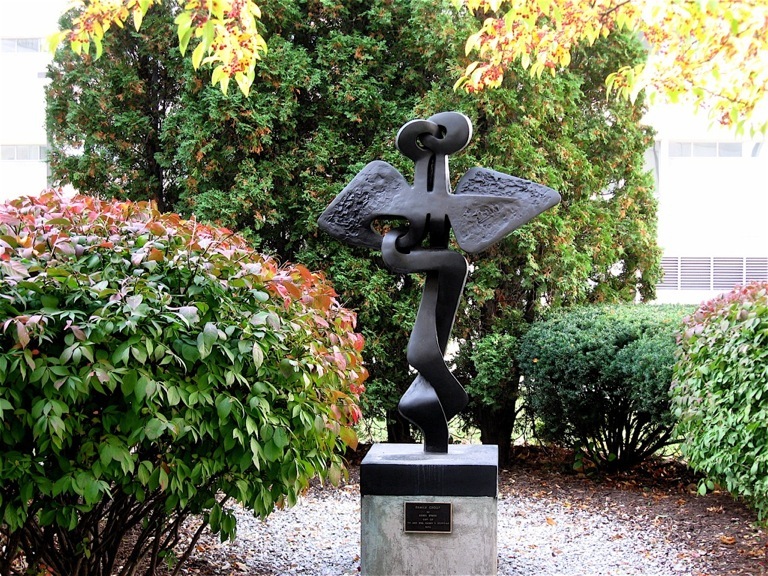 I knew Detroit Receiving has one of the largest collections of modern art in the state, but never realized there were so many pieces of outdoor art found on the grounds of the DMC. What a pleasant discovery! 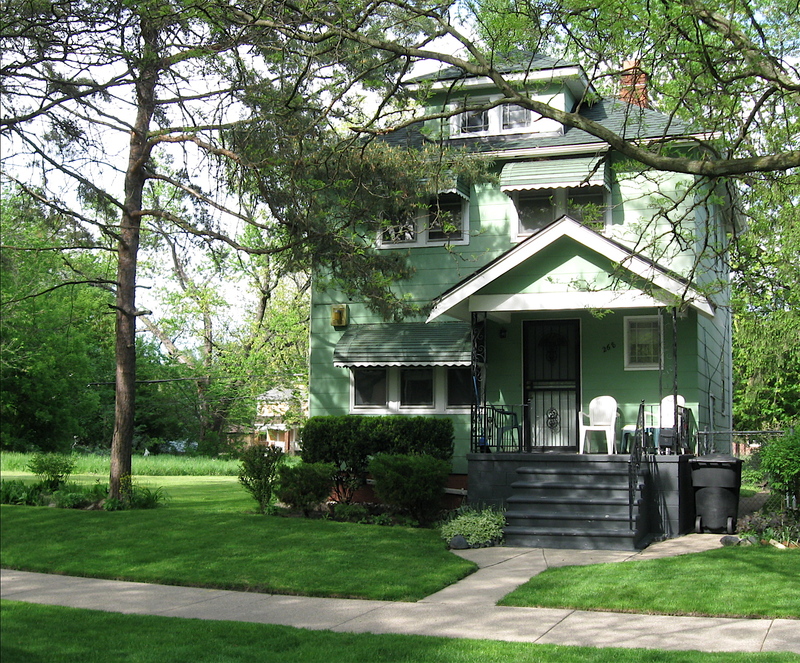 In May, I wrote about “A Fascinating Neighborhood” on Detroit’s eastside called Creekside. 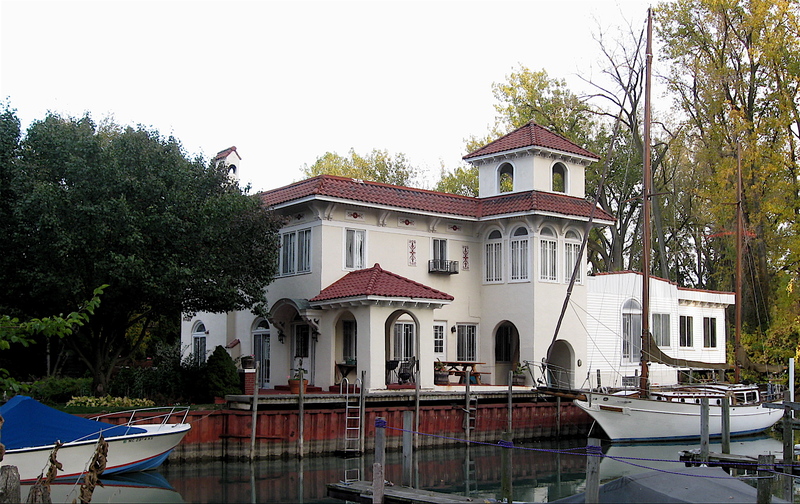 (Click here for story) This out-of-the-way community abuts the Detroit River, and one of its unique landmarks is the three or so miles of canals that crisscross the neighborhood. During Prohibition, rumrunners used the web of canals to smuggle liquor into the U.S. from Canada. In the May 26th entry, I mentioned that I’ve had a long fascination with the area and I’d be writing additional stories on the neighborhood. In this second entry, I’ll be focusing on the array of residential architectural styles found throughout the Creekside community. This area of the city, tucked away on the far eastside, south of Jefferson Avenue, has many quaint, brick paved, tree-lined streets with well maintained homes and surrounding landscape. However, like many Detroit neighborhoods I’ve ridden through, some blocks are showing signs of urban blight and decay with dilapidated homes needing major repairs. I saw several homes that have been stripped of their brick and others that have been scarred by fire. There are weed-filled lots, and I spotted open fields in some sections of the neighborhood. 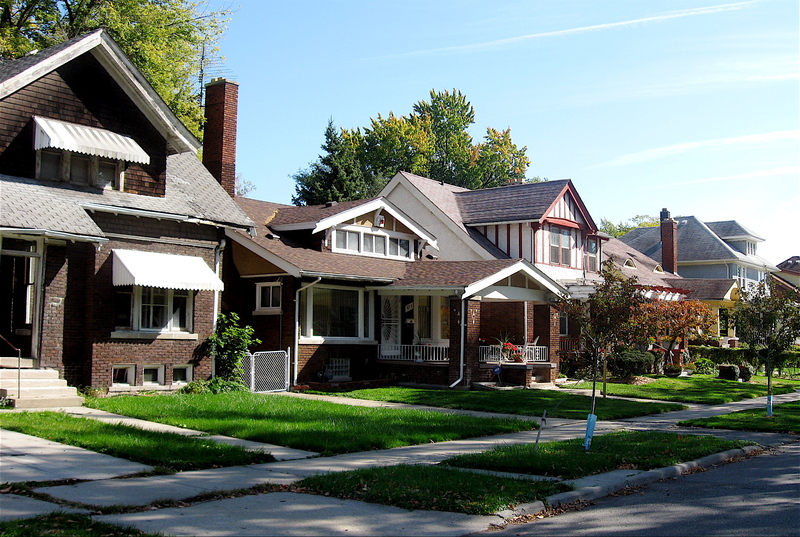 Regardless of a particular street’s condition, the community as a whole has a large concentration of well-preserved early 20th Century homes that include Arts and Crafts style bungalows, English Tudors, and small cottages. Most are brick, but many of the cottages backing up to the canals along Ashland Street are wood frame structures. Originally they may have been built in the early 1900s as summer cottages and over the years been converted to year-round residences. Larger, two-story frame homes are also found in the neighborhood. 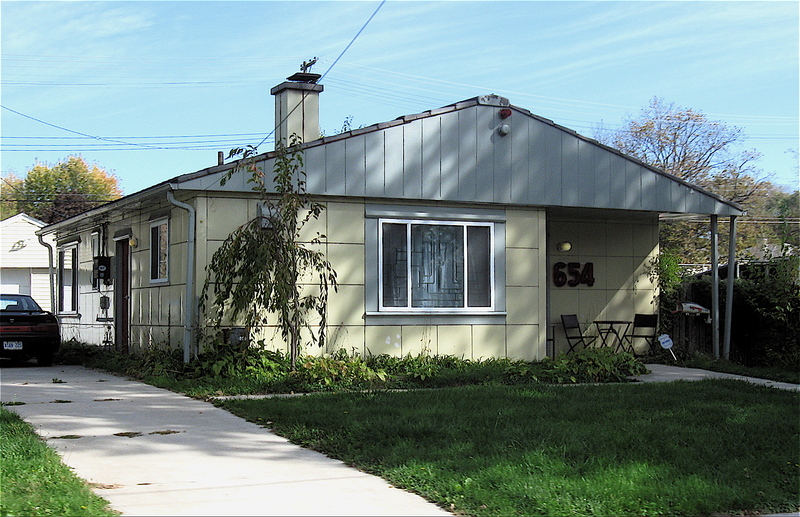 An American four-square style home. 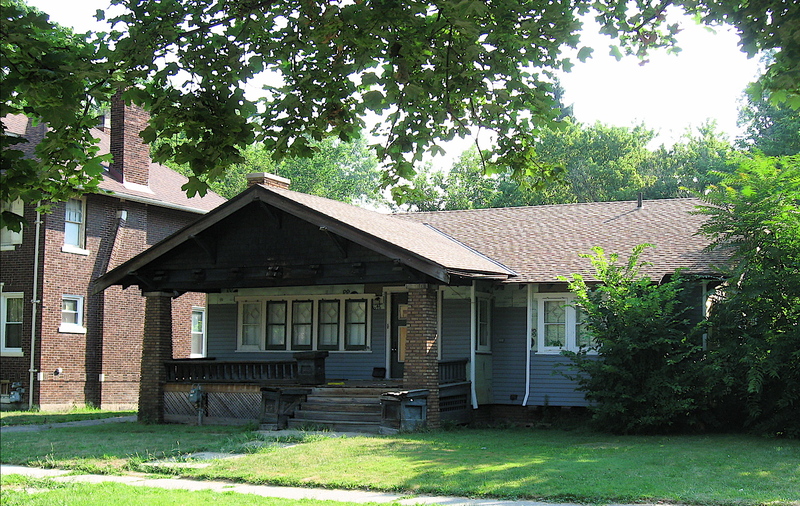 Other streets, such as brick paved Marlborough, have a large collection of traditional 1920s Craftsman style bungalows, much like those found in Highland Park. Built in the warm, inviting traditional Arts and Crafts tradition, they feature tall vertical windows, attractive wide porches with sloping roof lines and have natural materials, such as stone, incorporated into their design. The neighborhood is full of Craftsman bungalows. 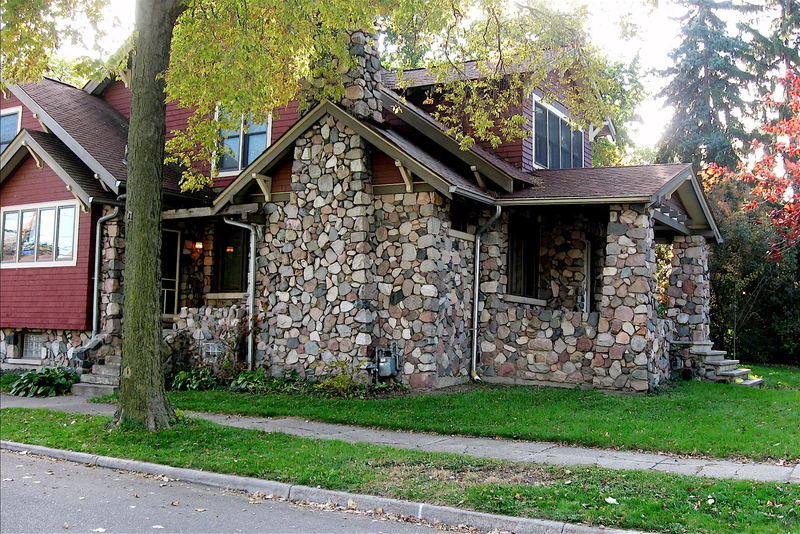 Check out the magnificent stonework on this once abandoned, now fully restored bungalow. Riding south off Jefferson Avenue on Manistique and Lakewood, I noticed the homes were much larger the closer I got to the Detroit River and the parks along its banks. That section of the neighborhood appears to be quite stable and the homes well maintained. Many of Creekside’s Tudors and other large brick homes are located in this part of the community. One street in particular, Harbor Island, features a variety of beautiful brick homes. Quite a few of them face the Detroit River, and all have access to the canals leading to the river. There are many English Tudors in the neighborhood. Note the brickwork and roof lines on this beauty. One of many gems found on Harbor Island. The neighborhood has a history of wealth. 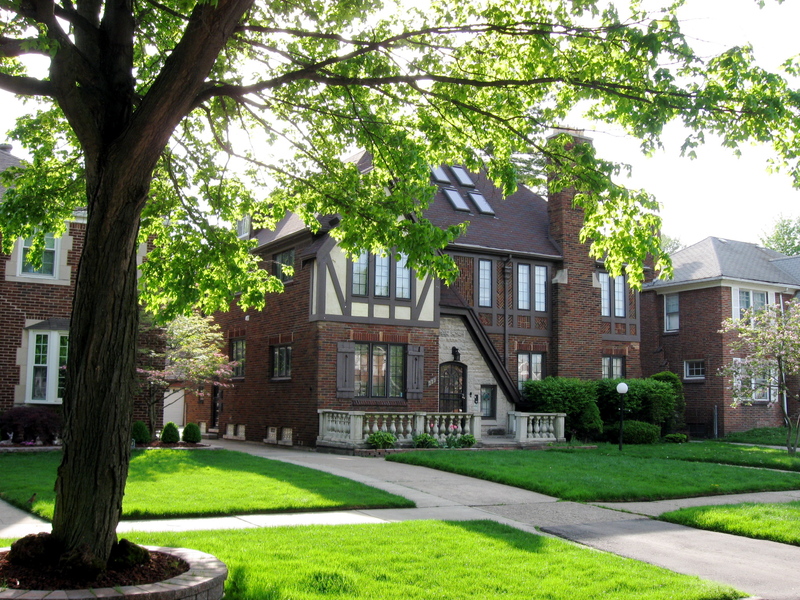 The Fisher Mansion, Lawrence Fisher’s ornate 22,000 square foot Spanish influenced designed home, was built-in the Grayhaven section of the neighborhood in 1928. Fisher was one of seven brothers involved in the early days of the automobile industry. 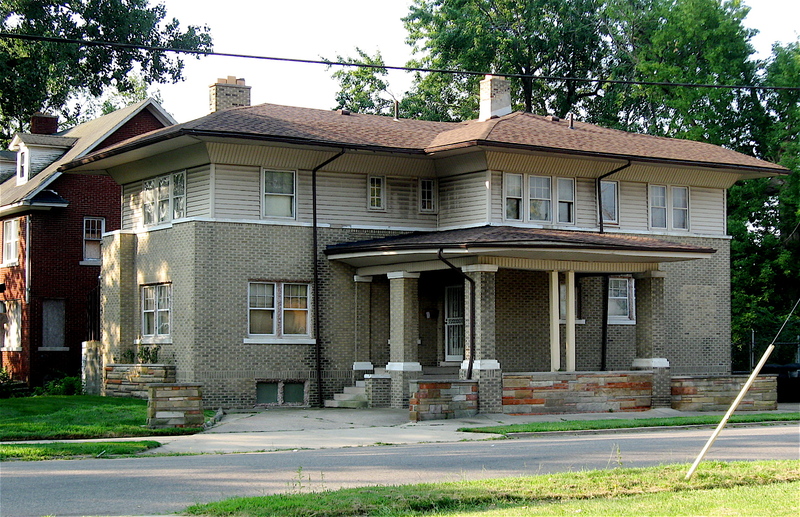 The home is now owned and maintained by the Hare Krishna religious group. Other notable mansions that once stood in Grayhaven included the Koerber family estate, founders of the Michigan Brewing Company, and the estate of boat builder and racer Gar Wood. Wood’s 46 room mansion was once used by motorcycle clubs and hippies. It eventually fell into disrepair and was destroyed by neglect and fire in the mid-seventies. Despite its mammoth size, the Lawrence Fisher Mansion has only two bedrooms! Bicycling through this neighborhood, I’m amazed at the great housing stock, canals, well-maintained parks and its access to one of the world’s busiest rivers. I often wonder why the beauty of this little corner of the city has been overlooked for so many years. 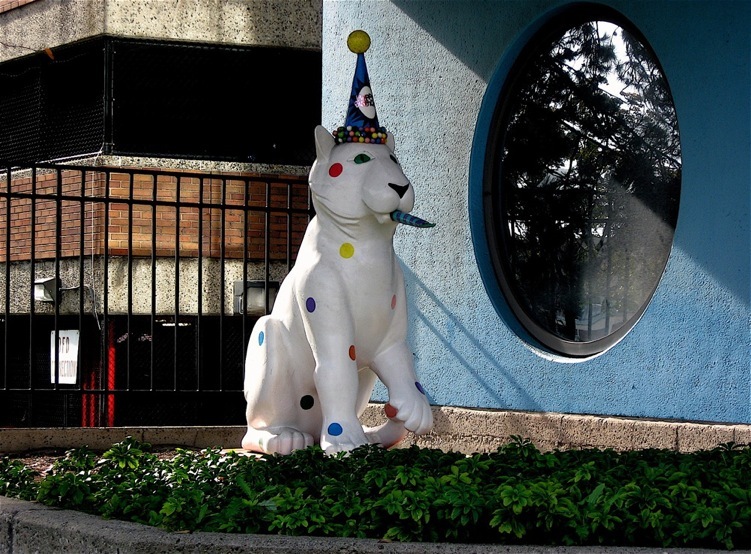 This story is part of an occasional entry on the Creekside Community. To view the other in this series, simply click on the headline below. 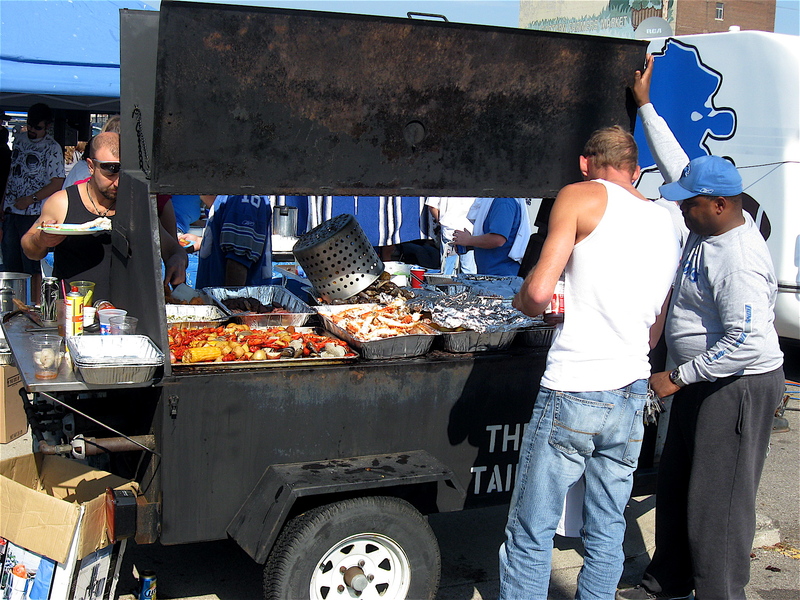 Since Ford Field opened in 2002, Eastern Market has been the place to be for tailgating on Lion’s game day. 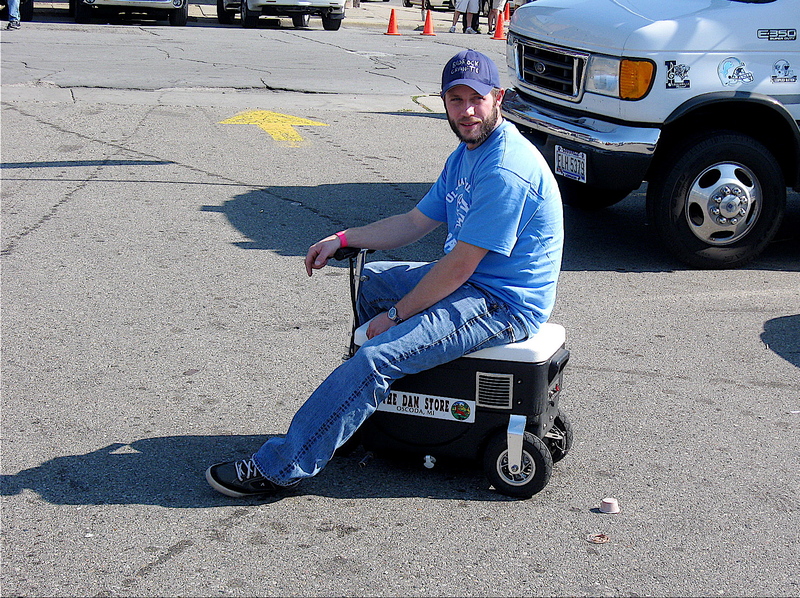 On those Sunday afternoons in the fall, the parking lots throughout the market are bathed in Honolulu blue with vehicles and tents everywhere painted or trimmed in the team’s colors. 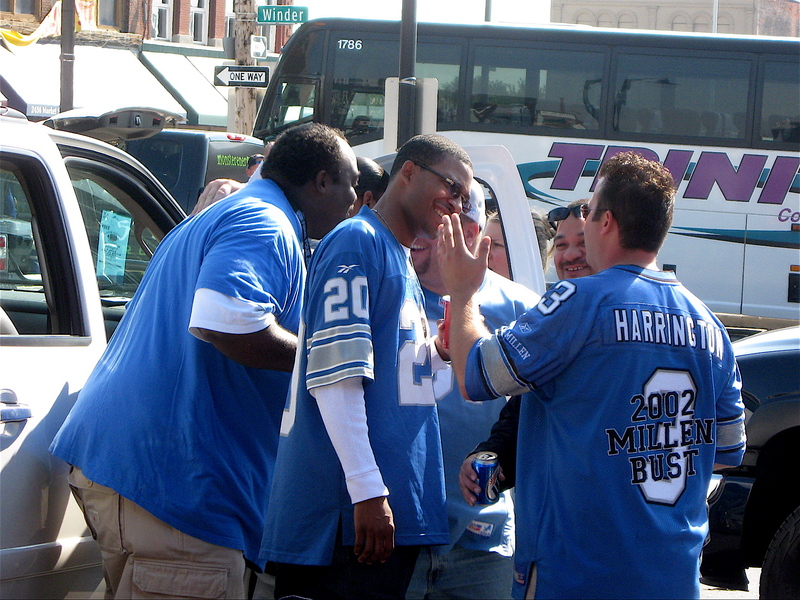 The fans milling about waiting for the game to start are proudly wearing Lion’s tee shirts, sweatshirts or jerseys with their favorite player’s name and number. Cycling around the market, I was amazed at the variety of vehicles featuring the home team colors. I spotted buses, motor homes, golf carts, scooters and cars across the area sporting the team’s blue and silver colors. There was even a working Lions hot tub set-up with bathers enjoying a cold beer. Cool car, the wheel hubs are painted Honolulu blue. 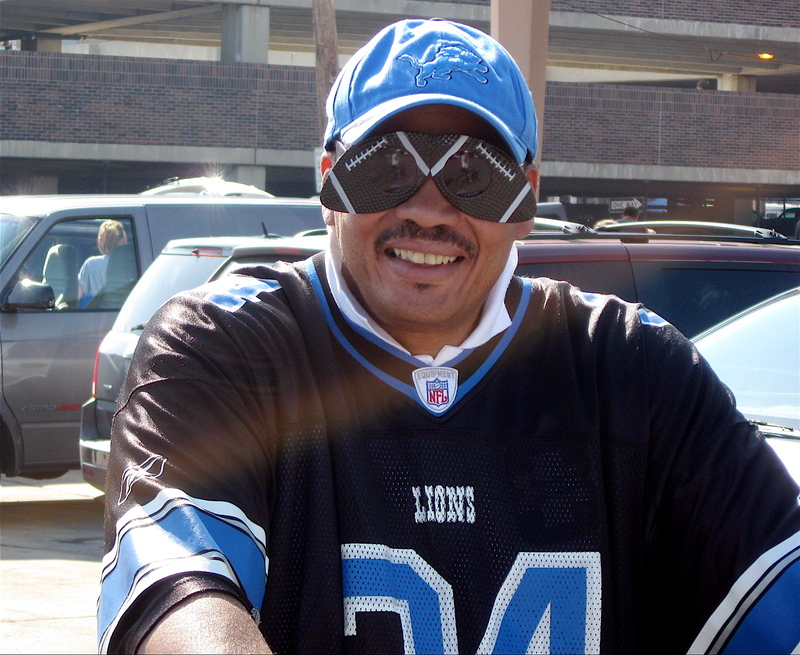 Rodney had the baddest sunglasses in Eastern Market. The atmosphere riding around the market before game time reminded me of a gathering of family and friends for an afternoon barbecue at a local park. Grills were fired up and smoking; steaks, chicken, and other meats were sizzling away alongside vegetables, filling the air with the sweet smell of barbecued food. 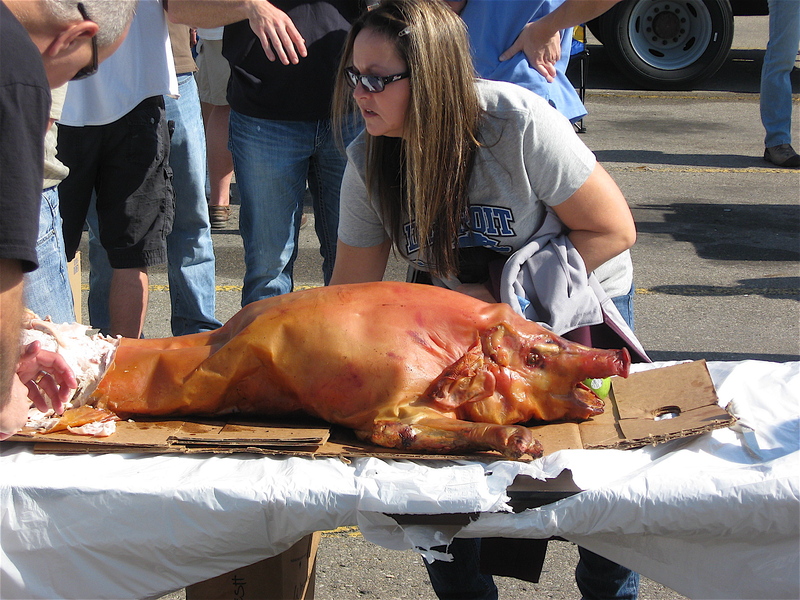 In some sections of the hazed over parking lots, people were lined up filling their plates from the variety of foods found on giant-sized barbecue pits. The younger crowd’s pre-game nourishment of choice seemed to be bratwurst, burgers and beer, in no particular order. I wonder how long it took to cook this? In addition to the barbecue smoke and rich smells of the food, there was a lot of other buzz in the air. Music was coming from everywhere, including two different bands set-up on opposite ends of the market, both blasting music from their respective sound systems. One featured heavy metal music, reminiscent of the band Black Sabbath. The other was cranking out Detroit style rock-n-roll. Adding to the mix were small sound systems scattered throughout the gatherings playing all types of music. I also heard pre-game statistics and predictions coming from radios tuned to local sports stations. There was a lot of movement in the crowds as well. 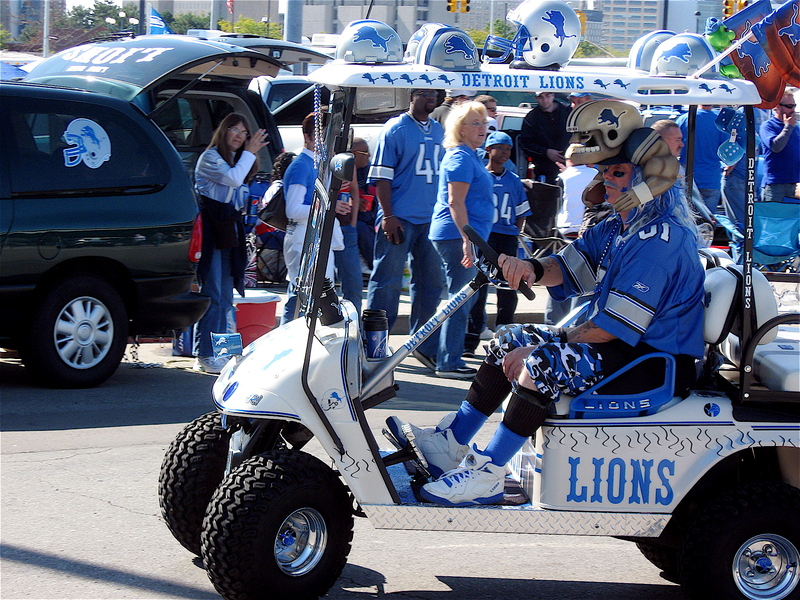 Decked-out Detroit Lions golf carts were zipping around, and believe it or not so were little electric-powered coolers one could sit on and drive. Quite cool! 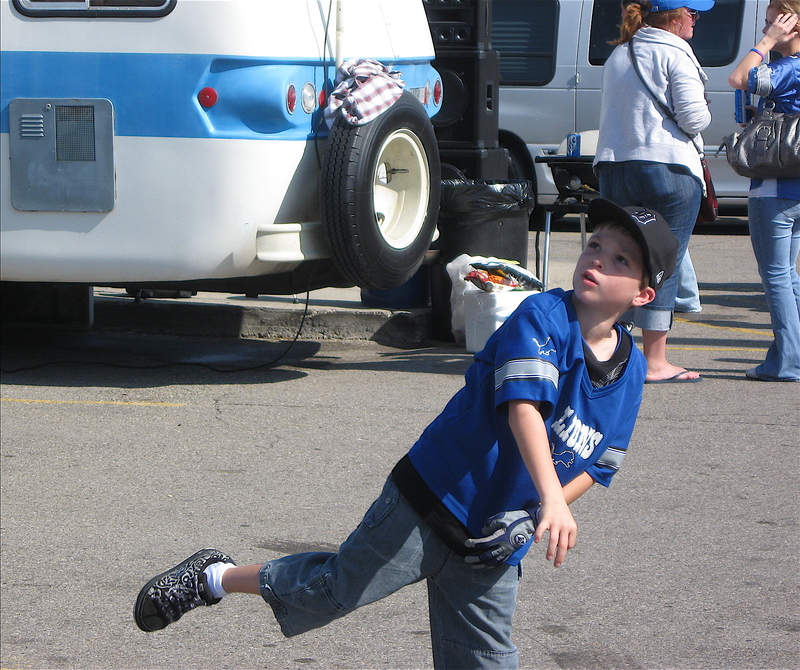 Footballs were flying through the air as dads played catch with their youngsters, and college age kids were throwing long bombs to each other across the parking lots. Beanbag toss seemed to be the activity of choice for those tailgating. Most of the closed-off streets in the market and parking lot lanes had many toss games going on. Judging by the cheering of those watching, you’d think the Lions finally won a game! This youngster threw a bullet to his dad! I spotted this cooler scooter everywhere. 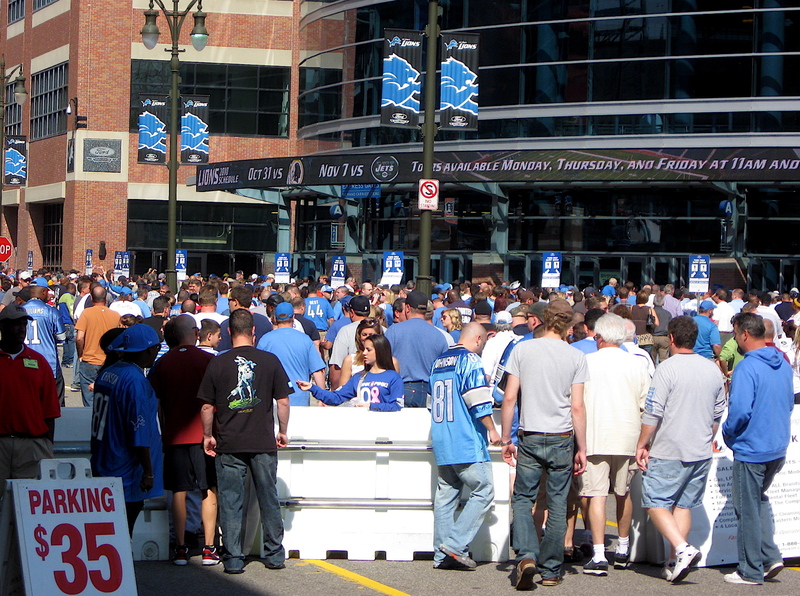 Close to the 1 p.m. kick-off time, fans holding tickets began to pack away their grills, tents and other belongings before heading over to Ford Field to watch their beloved Lions. It seemed everyone left at once, setting off a mass exodus as hundreds, maybe thousands, of those tailgating at the Market made their way down Gratiot Avenue to the stadium. Once there, it was like a freeway that’s suddenly reduced to one-lane, with thousands of Honolulu blue-clad people all trying to funnel their way into stadium. 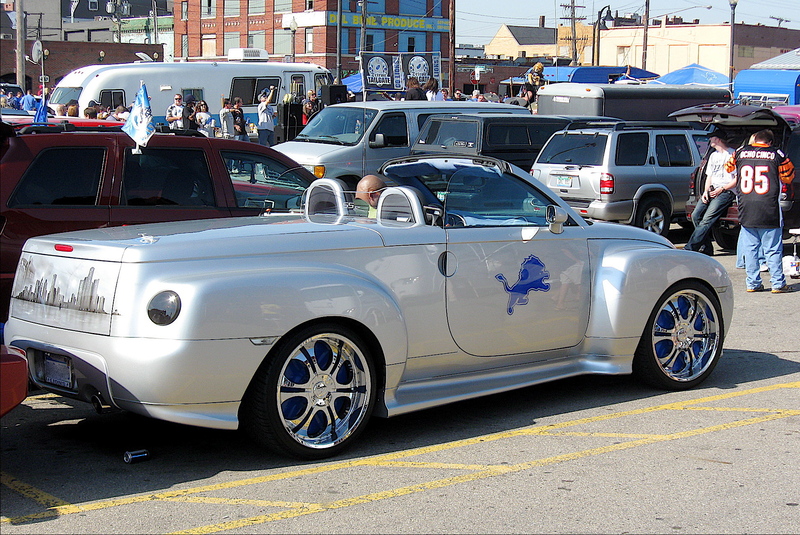 I understand the Lions finally won on this Sunday afternoon, beating the St. Louis Rams 44-6. A perfect ending for their loyal fans! 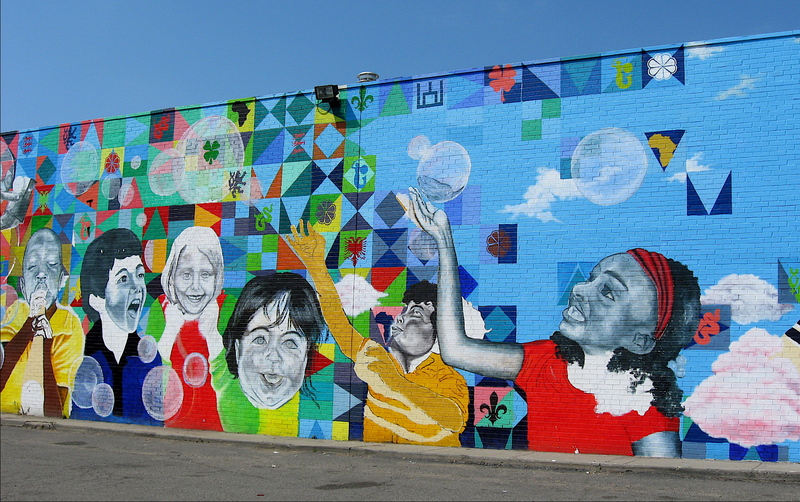 Southwest Detroit is one of the most active, vibrant communities in Detroit. It has at least three solid commercial strips with tons of activity on all of them. Bagley Street is packed full of Mexican restaurants and shops. Cycling Bagley reminds me of a small town main street where businesses are centralized, and turn of the century homes can be found just outside the business district. 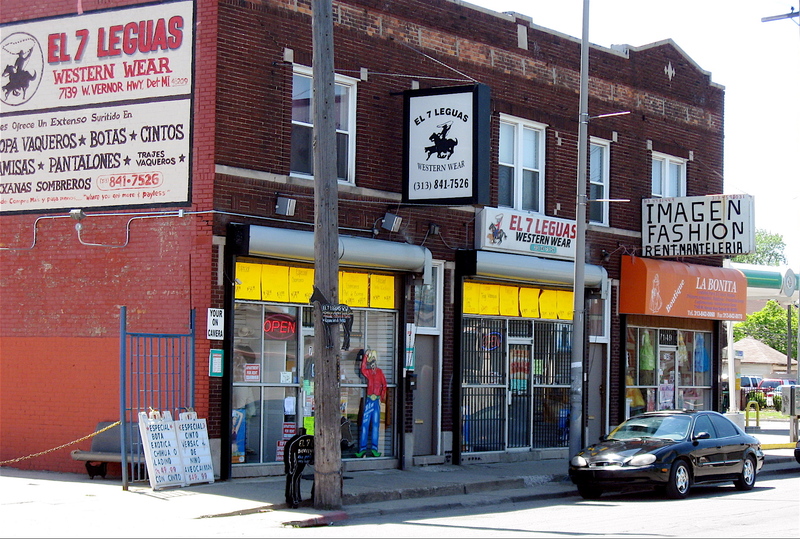 Michigan Avenue, that wide road leading from downtown to the suburbs and beyond, features a number of Mercados (markets) and small restaurants catering to the heavily populated Hispanic neighborhoods found in that section of the city. Bicycling on Michigan is a breeze because of its wide lanes and relatively light traffic. But, like many major roads in Detroit, watching for potholes and other road hazards is a given. Another major street in that part of Detroit is West Vernor Highway. It’s not really a highway in the true sense of the word, but a narrow, slow-moving major commercial street that cuts right through that section of the city. It is probably the most active commercial street in Detroit, and it features restaurants, Mercados, bars, clothing stores and several other small businesses and coffee shops. The numerous times I’ve ridden it, it has been jammed bumper-to-bumper with SUVs, dazzlingly colored, “low rider” vintage cars, pick-up trucks of all makes, and smoke spewing beaters. Add pedestrians crossing Vernor to the heavy vehicle traffic, and it can create a somewhat challenging bike ride. Also adding to the challenge of riding this street is its narrowness and cars parked along the curb. People swinging open their doors may not be expecting someone on a bicycle to come rolling by. 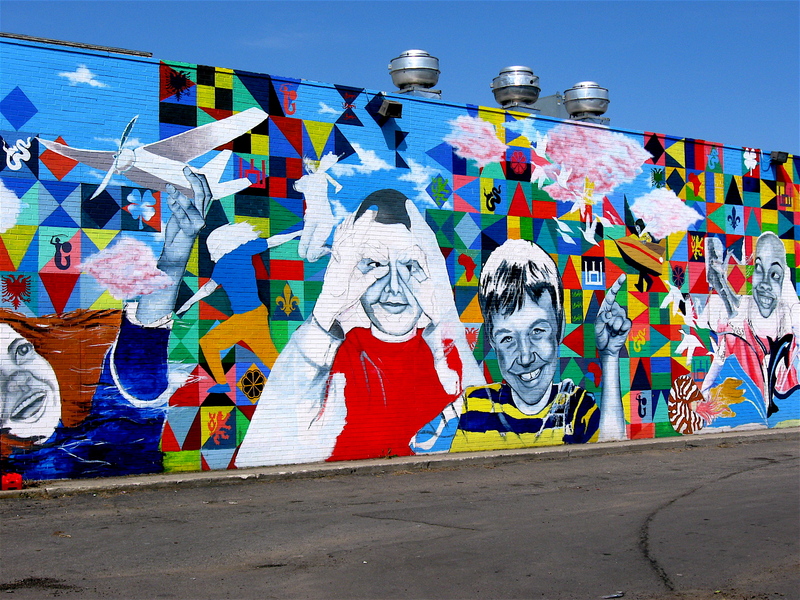 Having to concentrate on the various biking challenges of Vernor and the many congested streets in that area of Detroit, I’ve overlooked some great wall art found along those streets. Once I began to notice them, they seemed to be everywhere. 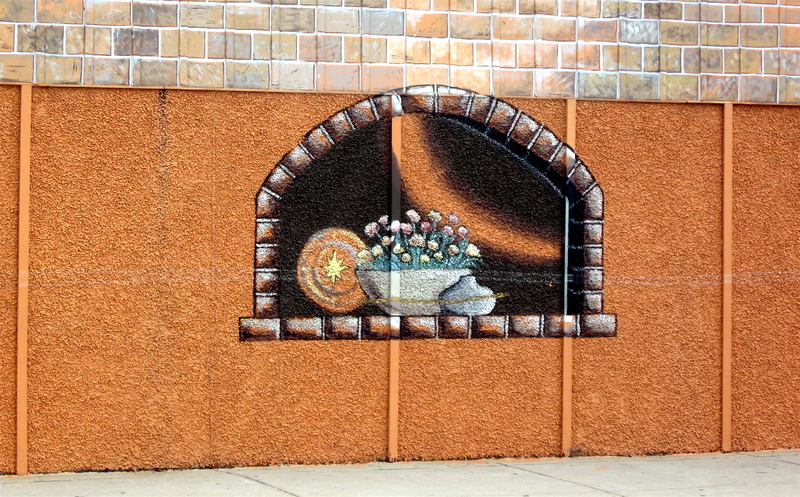 I started to see wall paintings on sides of restaurants and markets, on buildings facing parking lots and numerous other locations in the area. Some are two stories tall! Note the detail in this painting found on Michigan Ave.
More of the Michigan Ave. painting. This pointillism style paintings reminds me of Georges Seurat’s work. 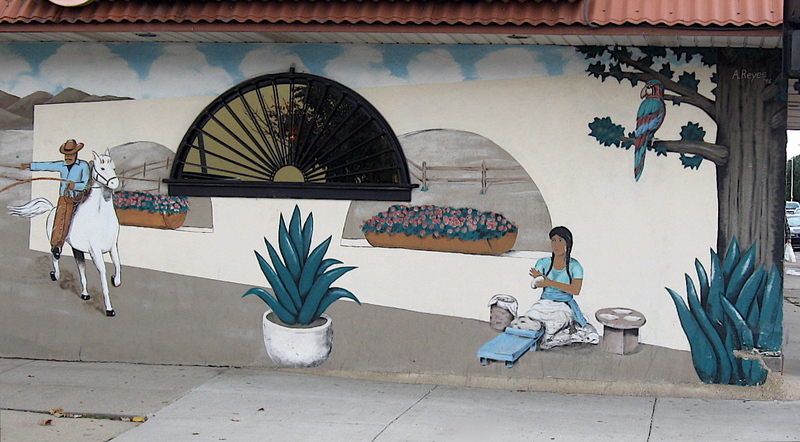 Hispanic influence is evident in many of the beautiful wall art paintings. Several use bright colors as well as muted, soothing pastel tones. Some feature scenes of the southwest, historical themes and other beautifully crafted images reminiscent of their heritage. 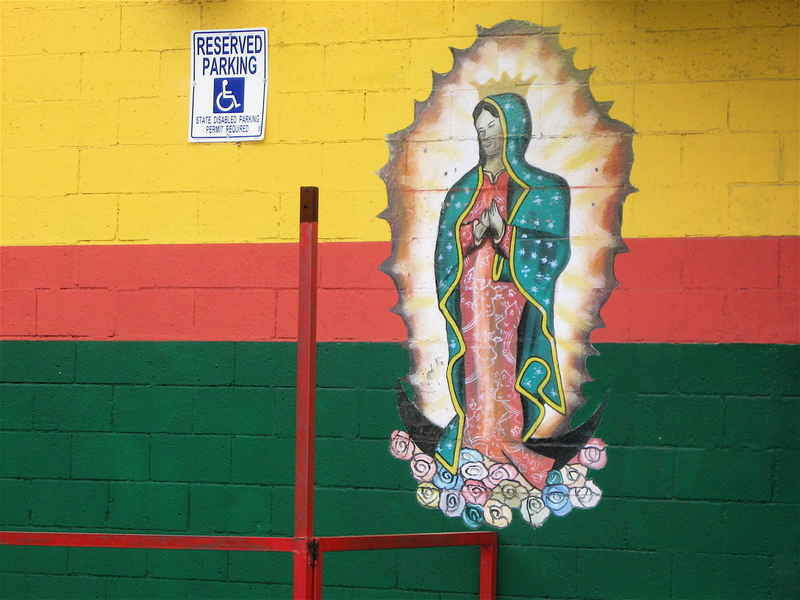 Cycling throughout the area, I’ve also spotted lots of colorful, highly detailed religious icons painted on buildings. I saw many religious paintings in the neighborhood. Nice use of pastel colors in this southwest scene. 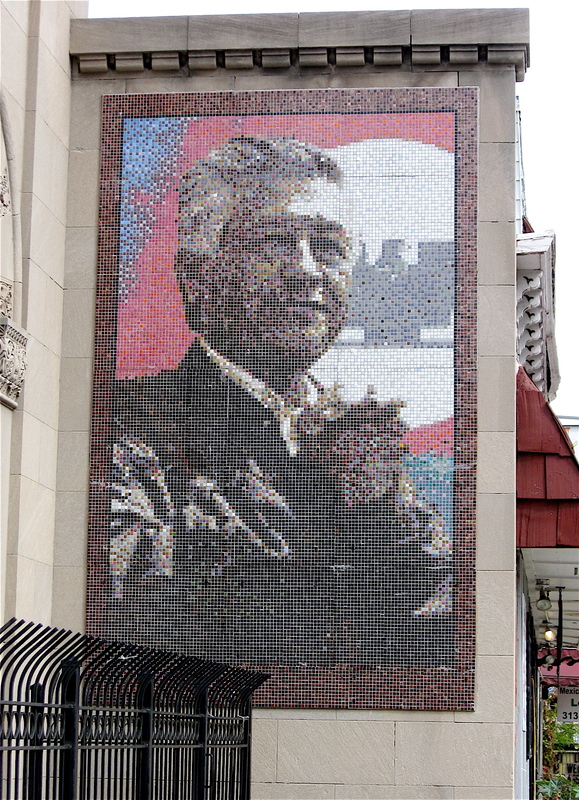 This mosaic features thousands of small tiles. 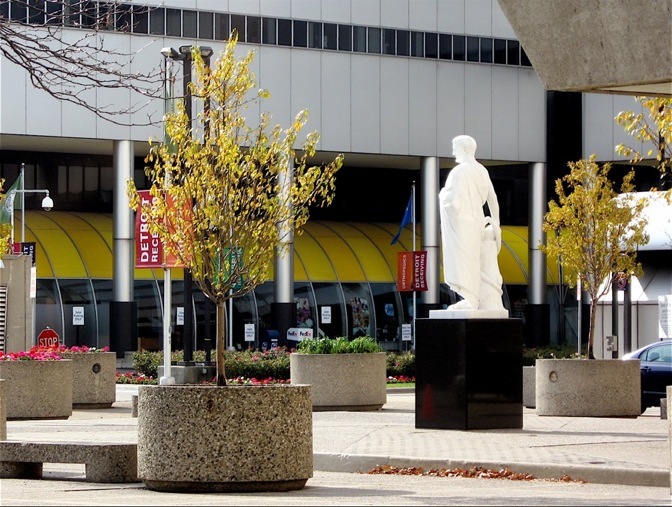 Looking beyond the busy streets while bicycling through this lively area of Detroit is a visible feast for the eyes. The wall art of Southwest Detroit is incredible. 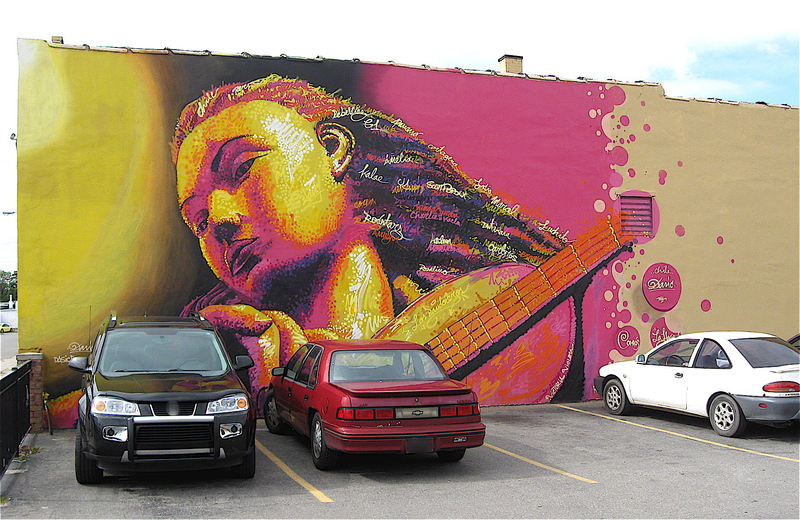 This beautiful painting is on Bagley Street. 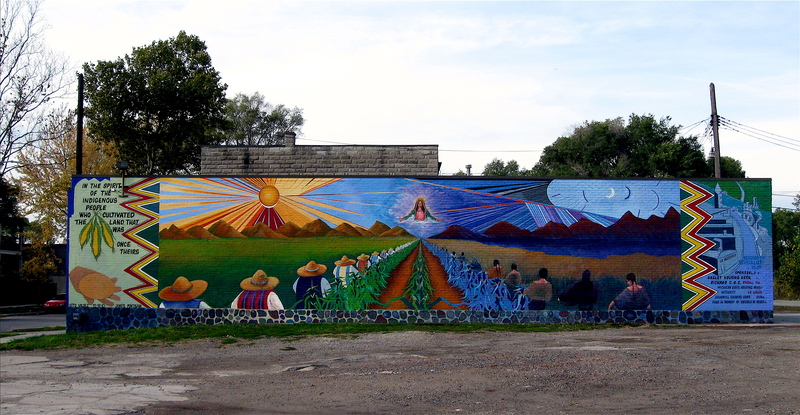 This is my favorite southwest Detroit wall painting.